English grammar has been closely bound up with that of Latin since the 16th century, when English first began to be taught in schools. Given that grammatical instruction prior to this had focused on Latin, it’s not surprising that teachers based their grammars of English on that of Latin. The title of John Hewes’ work of 1624 neatly encapsulates its desire to make English grammar conform to that of Latin: A Perfect Survey of The English Tongve, Taken According to the Vse and Analogie of the Latine. Since English is not derived from Latin, and has a very different grammatical structure, this is not a helpful model. Where Latin nouns have different endings for these various cases, English makes no distinction between the nominative, accusative, dative, vocative, and ablative cases. To describe English in this way is to introduce a whole set of unnecessary and unhelpful categories. Not all grammarians of this period were in thrall to the model of Latin; American lexicographer Noah Webster (1758-1843) dismissed the contention that the only way of truly grasping English grammar was by first learning Latin grammar as “a stupid opinion”. Despite Webster, the Latinate model survived into the twentieth century in the English classroom. H. W. Fowler, whose Modern English Usage (1926) was the most influential guide of the 20th century, read Classics at Oxford and spent some time as a Classics teacher before turning to lexicography. His linguistic prescriptions are soaked through with edicts derived from Latin grammar. The Latin use of the nominative case following the verb to be prompts Fowler to condemn English constructions such as it is me; according to Fowler, this ‘false grammar’ should properly be it is I. Fowler’s prescription continues to find loyal adherents today (if you are one – try saying it out loud); ironically, it is probably to blame for the widespread overcompensation (or ‘hypercorrection’) which leads to the preference for incorrect I in phrases such as ‘between you and me’. Gwynne’s Grammar (2013) continues this tradition; it is shot through with references to Latin grammar and draws extensively on its terminology. In an article published in The Telegraph on 16 January 2016, Gwynne advocated a series of reforms to our education system, including having English grammar taught by Latin teachers – it seems not to matter whether they have any training in English grammar – “against the background of Latin grammar”. 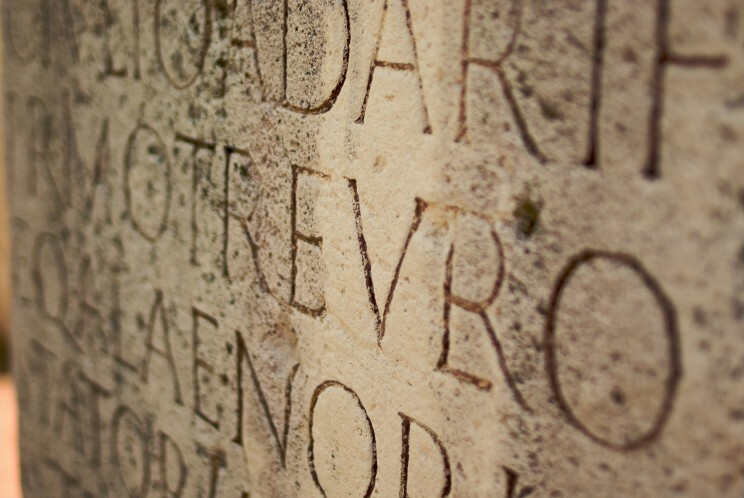 ‘Latin Letters’ photo, by Tfioreze. CC-BY-SA 3.0 via Wikimedia Commons. This focus on Latin also helps to explain why usage pundits are so concerned with preserving what they deem to be the correct (by which they mean the etymological) meanings of words derived from Latin and Greek, insisting that decimate means reduce by a tenth (from Latin decimus ‘tenth’), a dilemma must be a choice between two propositions (from Greek di ‘twice’ + lemma ‘premise’), unique must mean one of a kind (from Latin unus ‘one’). But since these words have been used in English for centuries, there is no reason why we should insist on preserving their etymological meanings. How often do you find yourself needing to describe the destruction of something by exactly a tenth, or choosing between precisely two alternatives? More usually, these words are employed to refer to mass destruction or a difficult problem, and have been since they were first borrowed into English in the 17th century. In his Proposals for Perfecting the English Language (1742), Thomas Cooke lamented that English cannot hope to imitate the excellence of Latin with its gerunds – nouns formed from verbs. Knowing how to identify gerunds continues to function as the hallmark of a sound grammatical education today, despite the fact that they have little significance for English grammar. A grammar test published in The Telegraph newspaper in April 2013 asked its readers to determine which of the following is correct: “Are you happy with my/me teaching you English grammar?” The correct answer was given as my, on the grounds that teaching is a gerund and therefore requires a possessive pronoun. But, in a well-concealed footnote, the author subsequently conceded that the alternative is also correct, since teaching could just as easily be considered a present participle. Since both are permissible, one might be forgiven for wondering what the point of the question was in the first place. Simon Horobin is Professor of English Language and Literature at the University of Oxford and a Fellow of Magdalen College. He has written extensively on the history, structure, and uses of the English language. He is the author of Does Spelling Matter? (OUP, 2013) and a number of books on the history of English, and the language of Chaucer. 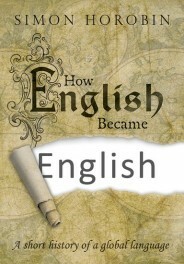 His latest book is How English Became English: A short history of a global language (OUP, 2016). The person that tried harder than anyone to force English into a Latin mould was Samuel Johnson – especially English spelling. Two of its most difficult aspects – consonant doubling and irregular unstressed vowels – were made inconsistent almost entirely by him. 2) He singlehandedly made the spellings of unstressed vowels in endings and prefixes highly irregular (fasten – abandon, truncheon, orphan; inquest – enquire). See the History page on my EnglishSpellingProblems blog for a fuller explanation of Johnson’s effect on English spelling. Surely decimate is reduction to a tenth, not by a tenth? No, to decimate was originally to kill every 10th man. What is the figure of speech for “precisely two alternatives”? As is well known, the first grammar of the English language, i.e. the “Pamphlet for grammar” of William Bullokar (1586), widely used the Latin grammar in English attributed to William Lily for the metalinguistic terminology, the formulation of grammatical rules, and the teaching methodology. In particular, the preface of Bullokar states that the work sholud not only improve the written performances of native English students and facilitate the learning of English for foreigners, but also access what we would call the Universal Grammar: “the æzier Entranc intoo the secrets of Grammar for other langages”. The main discovery made by Bullokar is that even English, like Latin, is in itself “a proper ruled tongue”, and that grammatical rules are largely universal. The title of the work is not “pamphlet for English grammar”, but only “pamphlet for grammar”, just like the handbook of Lily gave no explicit reference to Latin in its title: “An Introduction of the Eyght Partes of Speche and the Construction of the Same”. The perspective of the work of Bullokar is a comparison between Latin and English, which appears quite similar to that of a synchronic comparative grammar, with the aim of singling out the principles and parameters of Universal Grammar. For example, Bullokar has no problems in talking about “cases” in English, he exactly identifies the rules for the formation of the genitive and plural, and recognizes that other cases are not marked by morphological features but by other syntactic and semantic properties, as word order, in a way that recalls what in modern linguistics is the concept of “abstract cases”. All in all, I would like to stress that the influence of Latin grammar on English was not always misleading, but gave also a positive contribution to the development of grammatical theories.